With today’s #headlines, you can't afford to keep doing things the old way. Transform how you document your employee relations issues to achieve consistency, improve outcomes, and mitigate risk. Documenting day-to-day employee issues across your organization is now easy and standardized — resulting in more consistent data, experiences, and outcomes. All documentation and issue details are stored in a central repository, so data is available wherever you are and whenever you need it, regardless of turnover or attrition. 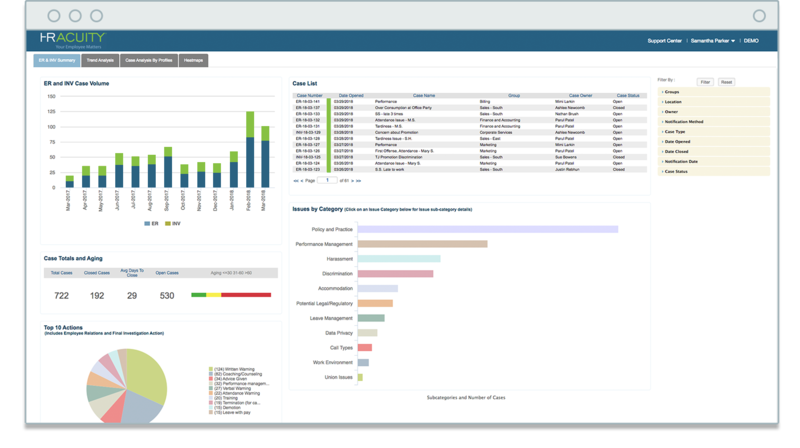 Built-in reports help identify red flags, concerning trends, or process gaps, so you can actively manage issues before they escalate and require investigations. Document cases quickly with our user-friendly process that removes the hassle and guides you to track the important details. Generate court-ready documentation and tell the story of your data with the click of a button. Make sure employee communication is clear, compliant, and neutral with standardized letter templates. Access related cases regarding involved employees to identify potential trends or patterns of behavior.